Flawless skin is always something that has evaded me. For as long as I can remember I have had pretty rubbish skin. Enlarged pores (that get blocked, of course), regular breakouts (hello, hormones) and residual pigmentation from said spots (yep, I’m a picker). I’ve gone through stages where my jawline has been so inflamed with cystic acne that it’s painful. I’d cover as much of my face with my hair as possible, sheepish because beauty editors should have great skin shouldn’t they? Trouble is, while my skin has always been as well behaved as a mardy teenager, being a beauty editor didn’t help. Chopping and changing my routine so I could try new products left my complexion in chaos. Our skin, I have learnt, loves consistency. Last year, I made a pact with my face: I would find a steady routine, if it calmed the heck down. Six months later and I’m now getting a couple of “your skin looks amazing!” compliments a week. And that was crucial: I’ve always wanted great skin, not just great makeup. Keep scrolling to find out the products that have transformed my complexion. From the off I knew I had to ditch oil from my regimen, there is not a single product containing oil that my skin likes. It’s just the way it is. So I worked through the ingredient lists on my products (with the help of facialist Kate Kerr) and stripped out any products that I didn’t even know contained oil. Moisturiser was out of the line-up too. Kerr told me that the thick cream I was applying at night was preventing my dead skin cells from lifting away leaving me prone to blocked pores and with a dull skin tone. I know what you’re thinking... but my skin doesn’t feel dry. It’s not genetically dry, it is dehydrated. For this I use a hydrating serum designed to improve my skin’s ability to product hyaluronic acid (a molecule that holds a 1000 times its weight in water) on days when my skin feels a bit tight. Interestingly I once gave up moisturiser all together for three weeks, testing my skin before and after, and surprisingly my skin’s hydration levels shot up indicating that moisturiser actually makes my skin lazy. Once I knew the banned ingredients, I started to consider what ingredients and types of products should be included. I wanted ingredients that would treat and prevent breakouts, for this I turned to acids: salicylic, alpha- and beta-hydroxy acids. I also wanted to use Vitamin C to brighten and even out my skin tone (licorice is also great for this). At night I knew I needed a retinol (a vitamin A derivative), it’s an anti-ageing powerhouse that jolts skin into action. As for specific product types I wanted a wash off cleanser, but also a micellar (for nights when I’m feeling lazy). A daily peel to ensure no dead skin cells were clinging on. Various serums to choose from or layer, depending on how my face feels each day (important when your skin is transitioning from frenetic to calm) and a mask to target either spots or uneven skin tone depending on my complexion come Sunday (that’s officially known as face mask night in my house). My current foundation has SPF30 BareMinerals Complexion Rescue Tinted Gel Cream (£28) but come summer I switch to Heliocare Color Gelcream Light SPF50 (£19) a tinted skin protector. As I mentioned earlier the key to great skin is consistency, so I gradually transitioned to my final routine and now I only add or switch in one product at a time if I want to try something new. That way, if I get a breakout I know it’s most likely due to the new addition. If I don’t, it stays. I’m cut throat and you should be too. Of course the myriad of skincare products can be daunting and confusing, which is why knowing your ingredients and the types of products that will fit into your routine is key. Below are the products I love, but of course my skin is not your skin. My complexion is oily / combination and prone to spots. If you have genetically dry skin or it’s very dehydrated, then you may well need something more heavy duty to hydrate. You may have crow’s feet or dark circles to contend with (I’m yet to wear an eye cream, I know, I know) but I just apply my usual skincare up to my eyes because it’s all so lightweight. 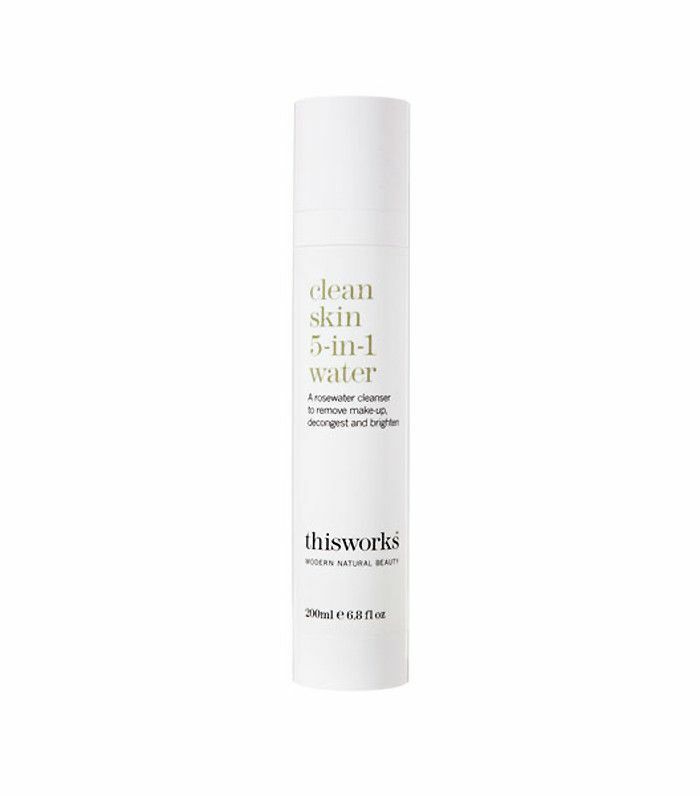 A no-frills yet brilliant cleanser, this contains glycolic and salicylic acid to gently but effectively remove dirt, makeup and dead skin cells to prep the skin ready for the next steps in the routine. First, this smells like roses, second it leaves skin feeling super clean and refreshed. Far kinder to skin than wipes, but just as quick and easy. I’m obsessed with at-home facial peels, and this peeling toner has seriously ramped up my skin’s glow. 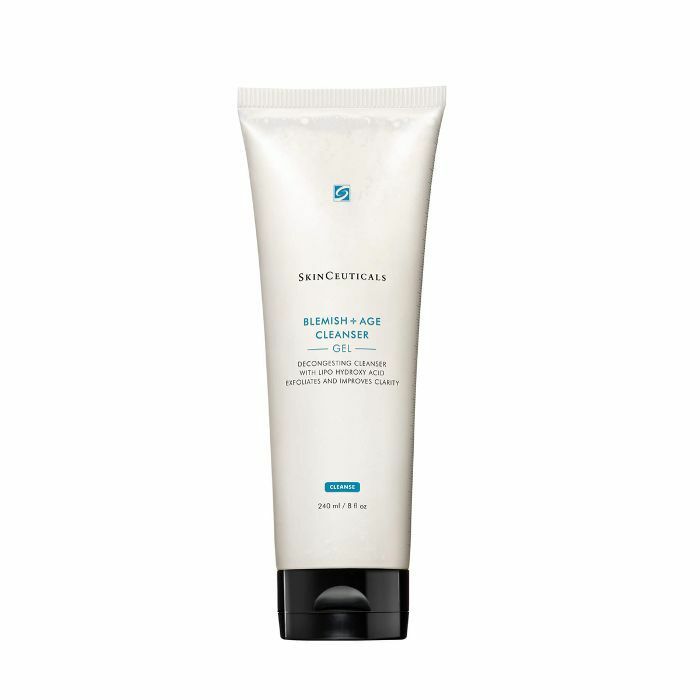 Just pour onto a cotton pad and gently swipe over skin post-cleanse. 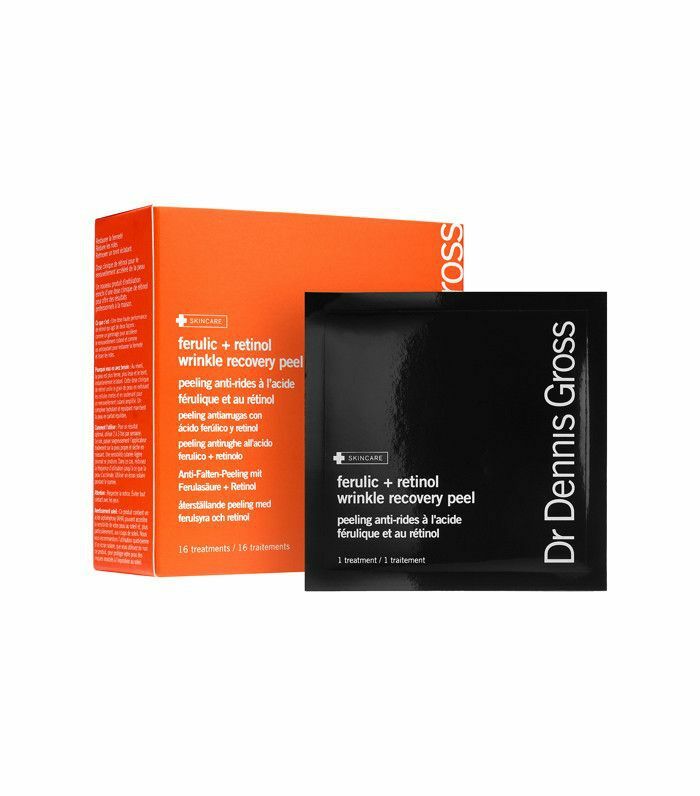 When I’m travelling, I take these pads, complete with ferulic acid and retinol, they pack an anti-ageing and exfoliating punch come nighttime. BareMinerals’s new serum has transformed my spot-prone skin. 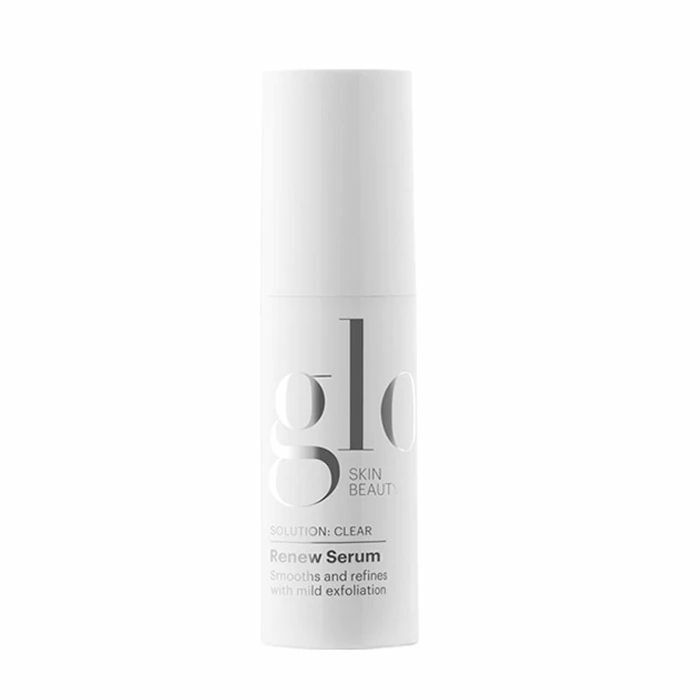 Read my full review of the spot-clearing serum here. 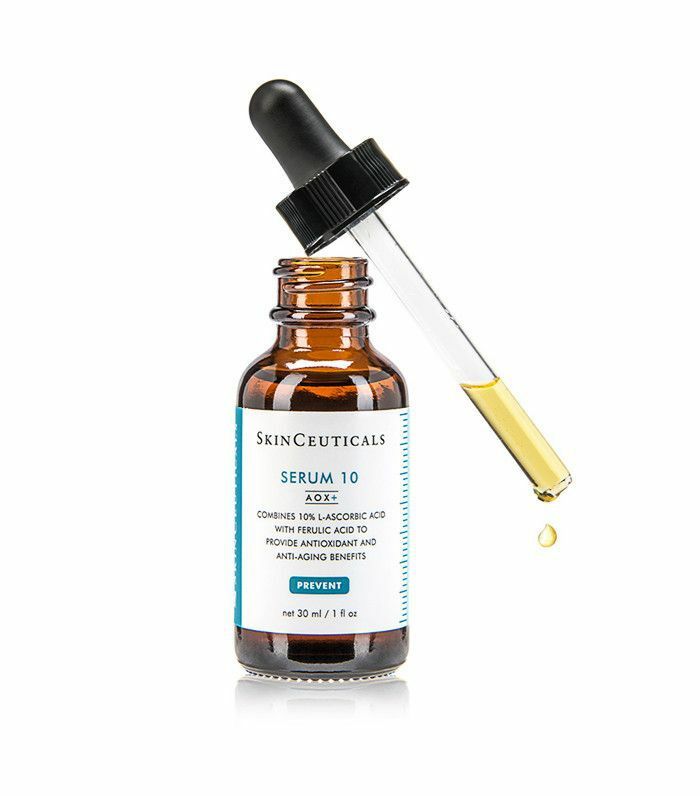 Kate Kerr recommended this antioxidant-rich, skin-protecting serum to me. Living in a city, it’s a must to have a potent dose of antioxidants in your routine. 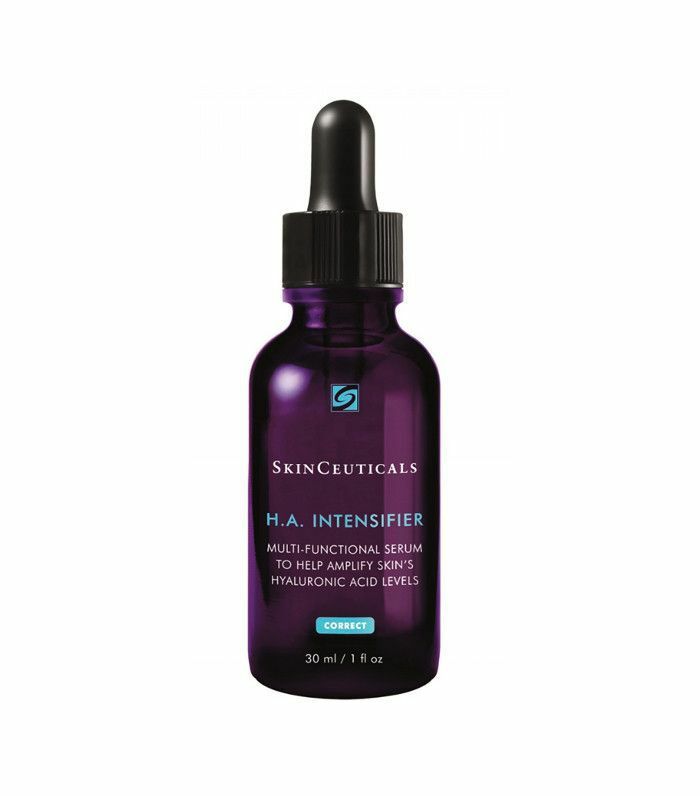 Another SkinCeuticals product, yes, I’m a fan. This is the serum I layer on if my skin is feeling a bit parched. Sometimes I’ll just smooth it over pronounced crow’s feet or forehead lines (a surefire sign of dehydration). It increases your hyaluronic acid production by 30%. I will never not use a retinol-based night product now, your skin is busy repairing while you sleep, so it makes sense to give it a helping hand. Retinol is an all-rounder ingredient that revs up your skin, getting it to work optimally, fast. 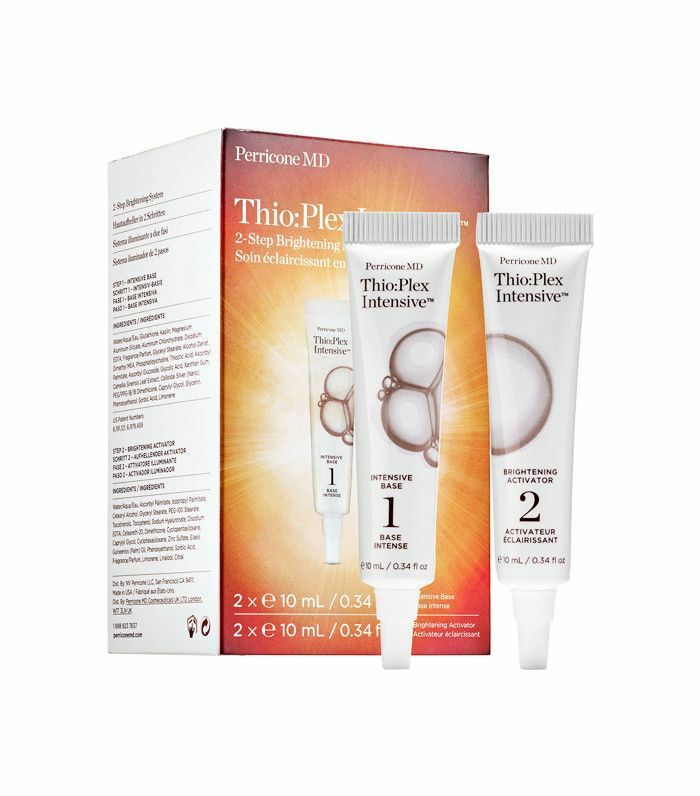 Think clearer skin tone, finer lines and more glow. I apply this down onto my neck and chest too. 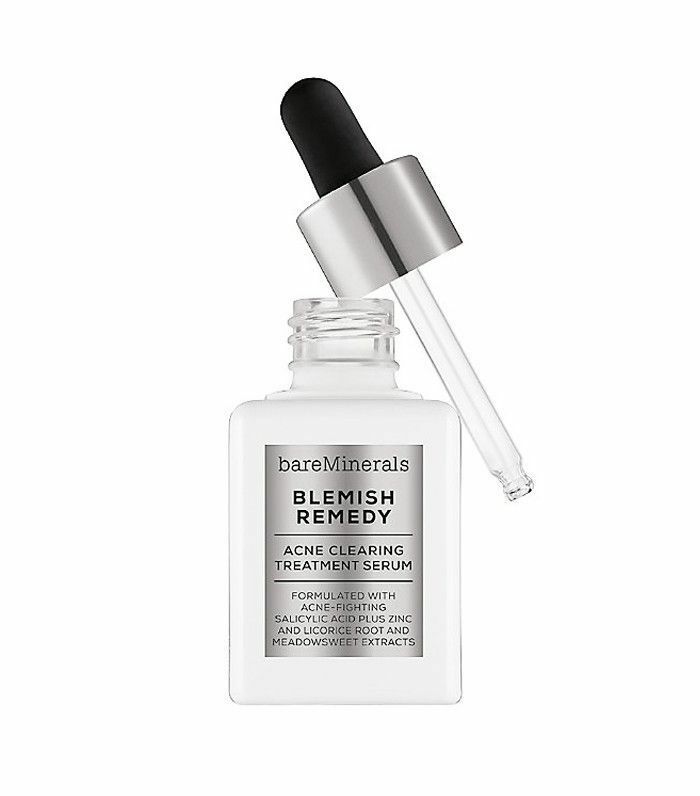 A.M.: BareMinerals Blemish Remedy followed by Skinceuticals Serum 10 and HA Intensifier where needed. P.M.: BareMinerals Blemish Remedy followed by Skinceuticals HA Intensifier (again, where needed) and Glo-Therapeutics Renew Serum. A new addition to my skincare family, this potent two-step mask is seriously brightening thanks to the inclusion of vitamin C esters. Flawless skin is finally mine.